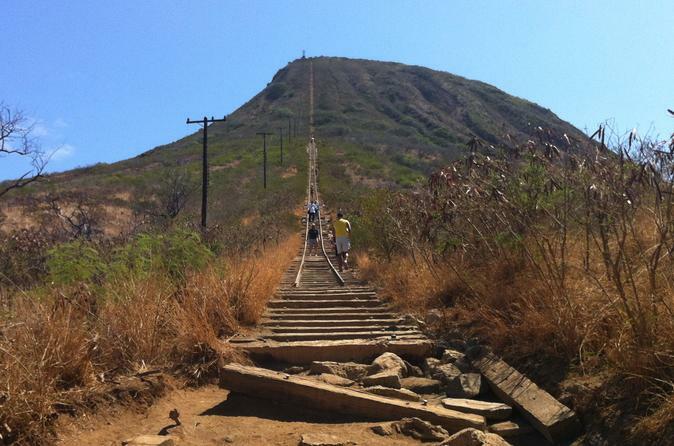 Enjoy hiking the stairs at Koko Crater as well as snorkel at Hanauma Bay. You will be able to see the aerial view of East Oahu from the top of Koko Crater as well as over variety of fish as you snorkel at one of the famous snorkeling spots on Oahu. This tour includes shuttle bus pickup from various hotels as well as snorkel equipment in which you can use in Hanauma Bay. Our shuttle will pick you up from Waikiki and we will begin the journey by taking you to Koko Head District Park where you will be able to climb the stairs of Koko Crater. This hike can be very strenuous but once you are get to the top you will see a view of Oahu and will amaze you. After you descend down to the bottom, we will take to Hanauma Bay in which you will snorkel at one of the most popular snorkeling spots on the island. We will provide snorkel equipment so you will be able to see a vast amount of fish that occupy Hanauma Bay. By doing both activites in one day, it will enable you to challenge yourself by hiking Koko Crater and then after that you will be able to cool off and snorkel at Hanauma Bay. It will be a day of hiking as well as be able to swim and relax at Hanauma Bay. 2:45pm Pickup from Hanauma Bay and return to our shop to return your gear and board our shuttle to take you back to Waikiki.